A few days before Christmas, a traveling entertainer is stuck at nightfall in a remote forest village after his van breaks down. He finds an inn and gets a room for the night. The next day, he finds himself in a nightmare that may not end. 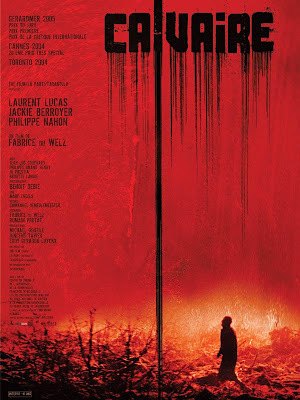 Belgian filmmaker Fabrice Du Welz's horrifying first film Calvaire is a dark and depraved psychological horror. With its stunning cinematography, surreal atmosphere, and disturbingly sickening gore, Calvaire stands as a highlight of the New French Extremity. This looks really good. I'm going to see if I can netflix this. Thanks. Looks pretty good, probably never see it though. might have to add that to netflix! This looks good, I should get to watching more foreign films! This in on my netflix queue right now. Can't wait til it arrives. The review makes it sounds like a winner!